Your favorite underdog urban park and mine (sorry chrism) is getting gussied up for the holidays. City workers were at Frost Park this morning adorning the one evergreen there with LED lights. As Erik mentioned, the tree is up outside the Broadway Center, lights are going up, maybe those pretty shiny little shooting stars will be next on the downtown light poles, and, before you know it, the turkey will be all gone, the streets will be filled with people going local for gifts, the presents will be unwrapped, the fireworks will have fired and it'll be 2009.
by Altered Chords on 11/18/2008 @ 9:51am Gotta love the faded chalk art that lingers on the wall. Like the warmth of summer clinging on to the days...refusing to yield to the cold and damp. The chalk off season may be over, but time can not fade the memories. by jamesstoweart on 11/18/2008 @ 10:00am Impromptu Frost Park Commentary Poetry. by izenmania on 11/18/2008 @ 10:05am What has apparently faded is any desire for anyone to show up without a formal chalk competition. We were getting together, socializing, having civic-minded discussions, etc. for a number of weeks before the chalk-offs started (in snow, in rain, in anything). But now that they have ended, that seems to have fallen by the wayside. Over the last two Fridays, 100% of all people seen eating lunch in Frost Park between noon and 1 have been named Izenman. Certainly I'm not expecting it to maintain chalk-off levels of attendance, but seriously... nobody? by jamesstoweart on 11/18/2008 @ 10:13am I fear if i go down there in an informal manner some young punk will step up to me gunslinger style and challenge me to a no holds barred unsanctioned blood sport chalk-off. I have kids to think about. by KevinFreitas on 11/18/2008 @ 10:59am I'm there this Friday. Any other takers? Heck, after Thanksgiving we can all huddle around and sing carols or something! Perhaps a kind local warm drink shop would even provide hot chocolate or some such thing. by Erik on 11/18/2008 @ 12:25pm I'm there this Friday. Any other takers? Heck, after Thanksgiving we can all huddle around and sing carols or something! Those are dangerous words to speak in the open blogosphere there Kevin. You could start (another) stampede. This Friday at noon? Hmmmm. by Erik on 11/18/2008 @ 1:03pm Perhaps there needs to be a Frost Park Christmas/Festivus party. Festivus is an annual holiday invented by writer Dan O'Keefe and introduced into popular culture by his son Daniel, a scriptwriter for the TV show Seinfeld. 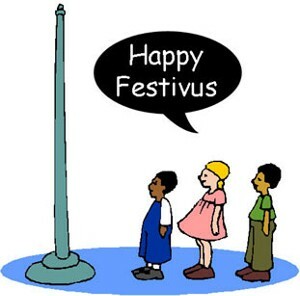 Although the original Festivus took place in February 1966 as a celebration of O'Keefe's first date with his wife, Deborah, most people now celebrate the holiday on December 23, as depicted on the December 18, 1997 Seinfeld episode "The Strike." According to O'Keefe, the name Festivus "just popped into his head." by Dave_L on 11/22/2008 @ 2:16am The lit Frost Park tree looked nice tonight. Stowe's chalk portrait of Officer Frost still hanging on. I think the wall needs a washing though. I'll work on it. by Erik on 11/22/2008 @ 10:13am The lit Frost Park tree looked nice tonight. Yeah. Its a great tree in Frost Park with blue lights!